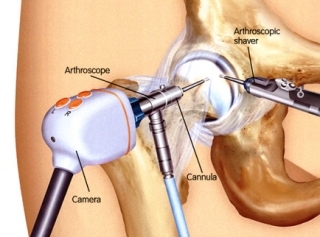 The procedure of inspecting interior joints with a tiny 4 mm lens arthroscope is known as Arthroscopy. Incisions are made on the diseased joints for the diagnosis and treatment. Hip arthroscopy is a surgical procedure to treat the problems in the articular cartilage, labrum , or other soft tissues that surrounds the diseased joints. The cause of problems in hip can be due to some injuries or due to certain orthopedic conditions. Dysplasia: In this situation the socket becomes shallow and the labrum become more sensitive to pull apart. Femoroacetabular impingement : Here the bone grow around femur head or socket and bone get damaged. Synovitis: This condition refers to the inflammation of the synovial lining. Snapping Hip Syndrome: The tendon gets damaged due to wear & tear or excessive damage. Loose bodies: loosely movement of some bone or cartilage fragments within the joint. A tension is made on the leg in order to get the surgeon an opportunity to observe the hip clearly and to insert the instruments properly. A small incision is made in the area of disease joint. Other incisions made for the insertion of other instruments. Diagnosis and treatment is done according to the situation. The duration of the procedure depends on the complexity of the disorder in the hip. Usually done as a day care procedure. Dr. Raju Eswaran an experienced orthopedics provides the Hip Arthroscopy in Delhi. Along with arthroscopy treatment he is expert in various orthopedic treatments such as joint replacement, joint preservation, sports and exercise medicines. Quality services are given to the patients in an affordable cost.